Attention: Solar charger(15000mAh capacity) is for emergency use, not a main charging resource, it takes about 40h to fully charge under direct sunlight, so it is recommended to charge by wall charger. Battery comes with a hook so you can simply attach it to your backpack when in outdoor and it will soak up energy from sun. Elegent small and portable easy to use. Built-in LED can be used as a torch, or as emergency lighting in darkness, the flashing light mode can be used as SOS. 4 LED status of charge indicators indicate the charging and discharging process. Waterproof dustproof and shock-resistant, ideal for outside use. Long lifespan with more than 500 recharging times. 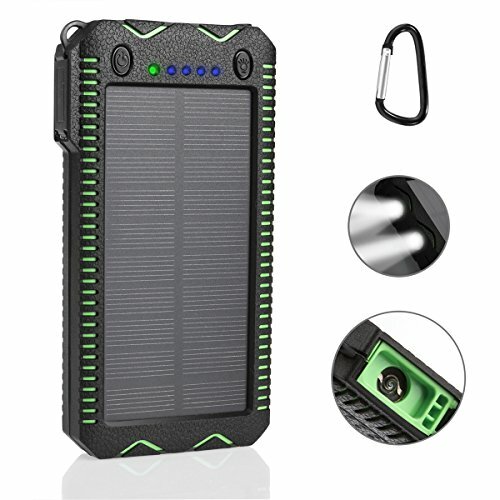 Multi Functional Solar Power Bank: Dual USB Charger Ports for charging two devices simultaneously; Intelligent LED indicator can be used as Torch / SOS Flashlight under different modes; Built in Fire Starter for outdoor survival, solar charging on the go. External battery charger with solar panel can recharge by solar or outlet. But please do not take solar as main power source as it's mainly for topping off. It takes about 40h to fully charge under direct sunlight, so it is recommended to charge by wall charger.